Royalty Free Photos, High Resolution Stock Photography and Scenic Photos: New England, Cape Cod, Massachusetts and more. "Mixed Media" at the Brewster Ladies Library: Main Street Brewster. Stop in and see two paintings by Bruce Christopher. 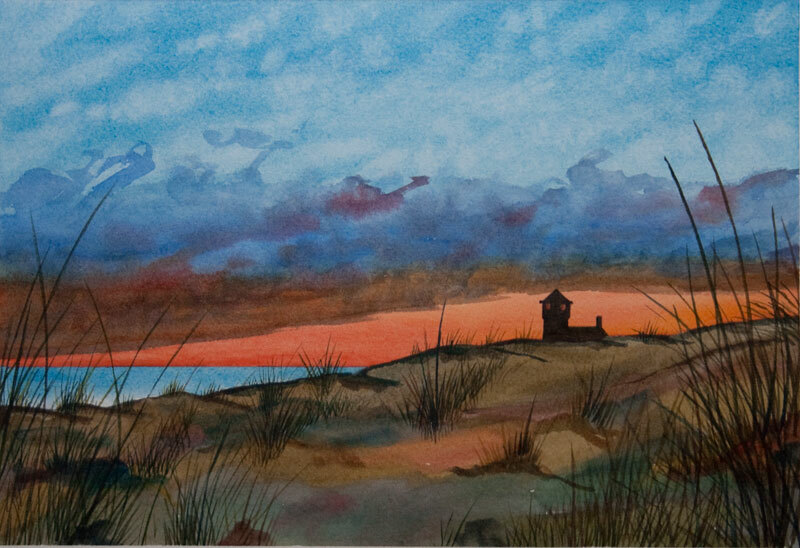 Click the photo to see the painting at a bigger size, along with other photos of Cape Cod Sunrises and Sunsets. Many of these galleries contain photography and/or links to online stock photo resources. You can also find high resolution stock photography with scenic photos depicting Coastal New England Landscapes. The galleries are updated regularly featuring royalty free stock photos of tropical scenes as well as royalty free stock photography and scenic photos. If an image contains a "Order Limited Edition Print" button, click it to order a printed high resolution printed photo, signed and numbered. All files marked for print or download are top quality, high resolution photographs, suitable for printing at 8x10, 11x14 and even larger in some cases. Enjoy your viewing and come back often to see new galleries. Chatham, Eastham, Provincetown, Truro, Wellfleet, Harwich, Harwichport and Sandwich. Copyright� 2006 Photos44. All rights reserved.